Gabbros recovered by previous ocean drillings were investigated in paleointensity and rock magnetic experiments. The young ages of the samples (ca. 0.78–1.3 Ma) enable a direct comparison between the plutonic paleointensity and volcanic data. Microscopic observations revealed two kinds of magnetite: needle-shaped exsolution in plagioclase and aggregate associated with the hydrothermal alteration of olivine. In Shaw paleointensity experiments, some samples revealed reasonable estimates, while some others showed an anomalously low ratio of natural remanent magnetization (NRM) versus thermoremanent magnetization (TRM). First-order reversal curve (FORC) diagrams indicated that the reasonable NRM/TRM were from non-interacting single domain magnetite exsolved in plagioclase, while the anomalously low NRM/TRM were from secondary magnetite associated with olivine. From the paleointensity results, the mean virtual axial dipole moment (VADM) was calculated to be 8.2 ±2.1 [1022Am2]. Volcanic records in the PINT database for 0.78–1.3 Ma revealed a mean virtual dipole moment (VDM) of 6.3 ± 0.73 [1022Am2]. The difference between them is consistent with the theoretical prediction of the cooling rate effect on paleointensity. These results indicate that oceanic gabbros are reliable paleointensity recorders. Past geomagnetic field intensity (paleointensity) provides important information to constrain the deep Earth dynamics and evolution. For paleointensity studies, it is crucial to test the fidelity of various rock types as paleointensity recorders. The fidelity of lavas have been confirmed by comparing paleointensity estimates from historical lavas with a known field intensity (e.g., Coe and Grommé, 1973; Oishi et al., 2005), although actual paleointensity reconstruction is far from trivial due to the complexity of natural materials. Unfortunately, lavas are prone to weathering, so fresh samples are difficult to obtain for the geological past. Consequently, many high-quality paleointensity data for the Precambrian originate from plutonic rocks (Tarduno et al., 2007; Selkin et al., 2008; Donadini et al., 2011). Nonetheless, the fidelity of plutonic rocks as paleointensity recorders remains unclear, as the long cooling times of plutonic rocks prevents a direct comparison with a known intensity. To assess the fidelity of plutonic rocks as paleointensity recorders, paleointensity and rock magnetic experiments have been conducted on oceanic gabbros. The samples were recovered by previous ocean drillings. Their young ages (ca. 0.78–1.3 Ma) have enabled a direct comparison of the paleointensity estimates derived from them with those from volcanic materials. Using the volcanic data as reference, the fidelity of plutonic paleointensity was tested. Specifically, two major problems associated with plutonic paleointensity investigations are addressed in this paper: the cooling rate effect and hydrothermal alteration. The cooling rates differ significantly between laboratory experiments (samples cool in 20–30 minutes) and plutonic rocks (cool in thousands to millions of years). Single domain (SD) theory predicts ~3–7% change in magnetization per one order of magnitude change in cooling rate, with a slower cooling resulting in stronger magnetization (Dodson and McClelland-Brown, 1980; Halgedahl et al., 1980). This should correlate to the same amount of bias in paleointensity estimates. This prediction was directly tested in control experiments by changing the cooling time between a few minutes to tens of hours, and the prediction was generally supported, but with a large sample-to-sample variation of a factor of 3–5 (Fox and Aitken, 1980; Chauvin et al., 2000; Genevey and Gallet, 2002; Leonhardt et al., 2006; Ferk et al., 2010; Yu, 2011). For plutonic rocks, the theory predicts that the paleointensity estimate will overestimate the true field by ~30–60%, and it has become common to use these values as correction factors (e.g., Tarduno et al., 2007; Selkin et al., 2008; Donadini et al., 2011). However, the large sample-to-sample variation observed in the control experiments, if extrapolated, implies very large uncertainties in an actual overestimate. Besides, only a few plutonic rocks contain solely SD magnetic grains, and larger pseudosingle domain (PSD) grains are the major carriers of paleomagnetic information. Winklhofer et al. (1997) argued that some magnetic grains near the SD/PSD size boundary can have a cooling rate bias that is opposite in sign to SD grains on the basis of micromagnetic simulations. 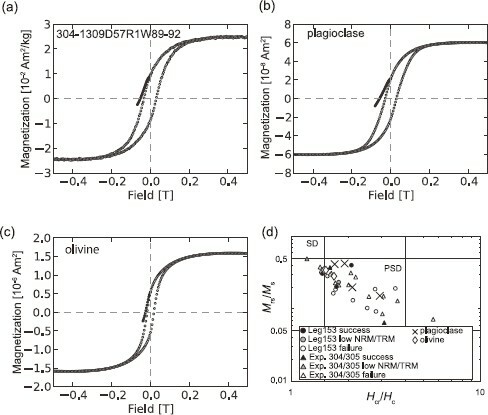 Yu (2011) experimentally showed that the cooling rate effect for PSD grains is less significant than that for SD grains. Irrespective of these uncertainties, the cooling time of plutonic rocks is unattainable in the laboratory, and direct tests of the cooling rate effect on paleointensity are impossible. Comparison between young oceanic gabbros with volcanic estimates could constrain the cooling rate effect. Another challenge in paleointensity studies of plutonic rocks is hydrothermal alteration due to the long cooling time. Hydrothermal alteration of mafic minerals produces secondary magnetic minerals that could contaminate the paleointensity record. Targeted measurements of magnetic inclusions in silicate crystals may exclude the contamination (Cottrell and Tarduno, 1999; Tarduno et al., 2006). Several studies have shown that plagioclase or clinopyroxene in some plutonic rocks contain tiny, exsolved magnetite inclusions which are near stoichiometric and magnetically stable (Davies, 1981; Feinberg et al., 2005; Usui et al., 2006). However, the strong texture of such a magnetite within a host mineral produces a large magnetic anisotropy (Feinberg et al., 2006). This makes paleointensity experiments using single silicate crystals difficult when they contain exsolved magnetite (Usui and Nakamura, 2009), whilst a near-random texture of host minerals would reduce the magnetic anisotropy at a whole rock scale (Usui et al., 2006). If one uses whole rock samples, it is necessary to discriminate samples whose magnetic signals are dominated by secondary magnetic minerals. However, secondary magnetite formed after the hydrothermal alteration of whole rock samples could also be near stoichiometric and magnetically stable (Kikawa and Ozawa, 1992; Usui and Yamazaki, 2010), and rock magnetic criteria to distinguish secondary magnetite is uncertain. I have used gabbro samples recovered by ODP Leg 153 and IODP Expedition 304/305. Both of the cruises drilled sites near the slow-spreading Mid-Atlantic Ridge. Leg 153 (Cannat et al., 1995) recovered gabbroic rocks from four sites (Site 921–924). The drill holes were relatively shallow with a penetration ranging from 14 to 82 m below seafloor (mbsf). Major rock types are gabbro and olivine gabbro. Lineated sea surface magnetic anomalies suggest a nominal age of ~1 Ma for the drill sites (Schulz et al., 1988). Previous paleomagnetic studies revealed that the samples showed some drilling-induced overprint, and that the maximum unblocking temperatures are near 580°C (Gee et al., 1995; Gee and Meurer, 2002), indicating the presence of near-stoichiometric magnetite. Up to three magnetic components, besides the drilling-induced overprint, were observed in some samples (Gee et al., 1995; Gee and Meurer, 2002). Gee and Meurer (2002) interpreted them as thermoremanence recorded in successive polarity intervals of ~1.07–0.99 Ma (Jaramillo normal polarity interval), 0.9–0.78 Ma (the Matuyama reversed polarity interval), and 0.78 Ma to present (the Brunhes normal polarity interval). Expedition 304/305 (Blackman et al., 2006, 2011) recovered gabbroic rocks mainly from Hole U1309D which penetrated 1400 mbsf. Direct U-Pb zircon dating revealed ages of 1.17 ± 0.2 Ma for 0–600 mbsf and 1.24 ± 0.02 Ma for 600–1415 mbsf (Grimes et al., 2008) that are slightly younger than the nominal age estimated from sea surface magnetic anomalies (1.5–2 Ma; Blackman et al., 2006, 2011). Similarly to the Leg 153 gabbros, previous paleomagnetic studies revealed that the majority of the samples showed some drilling-induced overprint, and that maximum unblocking temperatures are near 580°C (Zhao and Tominaga, 2009). I obtained oriented minicores and cubes, avoiding zones where intense alteration had been noted previously (Cannat et al., 1995; Blackman et al., 2006). Magnetically strong oxide gabbros were also avoided, because such rocks have been reported to be magnetically less stable (Pariso and Johnson, 1993) and likely to be less suited for paleointensity experiments. The total number of analyzed samples was 30. The samples were gabbro or olivine gabbro. From each sample, a small slice was cut for a thin section and rock magnetic experiments, and the remainder was used in paleointensity experiments. On thin sections, large opaque grains that crystallized directly from the melt were rare. Two main occurrences of magnetic minerals were found. One was opaque needles in plagioclase (Fig. 1(a)). This occurrence was similar to magnetite exsolved in plagioclase in other oceanic gabbros (Davies, 1981). The other occurrence was magnetite associated with the hydrothermal alteration of olivine (Fig. 1(b)). The extent of hydrothermal alteration of olivine varied within a sample as well as from one sample to another; thus, it was difficult to quantify the amount of magnetite associated with olivine from thin section observations alone. Clinopyroxene in my samples did not contain a significant amount of opaque minerals. Microscopic images of the occurrences of magnetite. (a) Needle-shaped magnetite (black) in plagioclase. (b) Magnetite aggregate (black) associated with the hydrothermal alteration of olivine. The primary component of NRM is recognized. A linear portion (R ≥ 0.995) in the NRM-TRM diagram exists. That should consist of the primary component, and should not be less than 15% of the original NRM intensity. The portion in the ARM1-ARM2 diagram corresponding to the linear portion in the NRM-TRM diagram is also linear (R ≥ 0.995). Its slope should be unity within 5%. The primary component and linear portions in both the NRM-TRM and the ARM1-ARM2 diagrams should include the maximum AF demagnetization step. To correct for the effect of anisotropy on paleointen-sity estimates (Selkin et al., 2000), the anisotropy of partial ARM was measured on samples that were successful in the paleointensity experiments. Selkin et al. (2000) reported that the anisotropy of ARM imparted with a high peak AF field reasonably approximated the anisotropy of the total TRM. Because the Shaw method uses only the high coercivity part of NRM and TRM, the anisotropy of the partial ARM of the corresponding coercivity window was used. I imparted a partial ARM in two steps (Trindade et al., 2001): first I imparted total ARM with the maximum AF field used in the Shaw experiments (100 or 150 mT), then I demagnetized the low coercivity fraction that was not used in the paleointensity estimation. Anisotropy tensors were calculated using the body-diagonal seven-orientation scheme (Borradaile and Stupavsky, 1995) with three-axis measurements. At each orientation, residual magnetization after 100 or 150 mT AF demagnetization was measured and subtracted from the partial ARM. The anisotropy tensors were evaluated using Jelinek's (1981) parameters. Further tests were conducted on the successful samples. To check if the laboratory TRM is really a total TRM, I imparted a second TRM (TRM2) on the same samples, after the anisotropy experiments, using a holding time of 30 minutes. The AF decay curves of the first TRM and TRM2 were compared. To test thermal stability, high temperature susceptibility measurements were carried out using a kappabridge KLY-4 (AGICO). Rock powder made from unheated chips was heated up to 600°C in air. Hysteresis measurements were carried out using a vibrating sample magnetometer (VSM) Model 3900 (Princeton Measurements Corporation) in JAMSTEC Yokosuka HQ. Rock powder of ~150 mg weight from each sample was prepared and packed in a gelatin capsule for measurements. The major hysteresis loop was measured for all samples. The saturation magnetization (Ms), saturation remanence (Mrs), coercivity (Hc) and coercivity of remanence (Hcr) were determined. For selected samples, I also measured first order reversal curves (FORCs) and calculated FORC diagrams (Pike et al., 1999; Roberts et al., 2000) using the software FORCinel (Harrison and Feinberg, 2008). FORC diagrams assess the distribution of microcoercivity and interaction field (Pike et al., 1999; Roberts et al., 2000; Carvallo et al., 2004). In addition, in order to examine the origin of the bulk magnetic characterization, mineral separates from selected samples were measured using alternating gradient field magnetometers (AGFM) model 2900 (Princeton Measurements Corporation) at the Kochi Core Center. Because hydrothermally altered olivine grains were fragile, they could not be extracted efficiently by crushing rocks. Thin sections were prepared and specific minerals were cut out under a binocular microscope using a non-magnetic diamond blade. In this procedure, glue was attached to the extracted minerals, so the precise weight of the mineral separates could not be determined. Mineral separates of a similar volume were measured to assess the relative contribution of minerals. 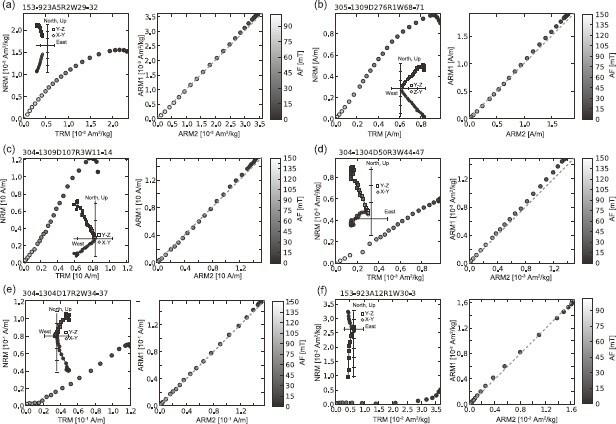 Figure 2 shows orthogonal vector plots of AF demagnetization of NRM. 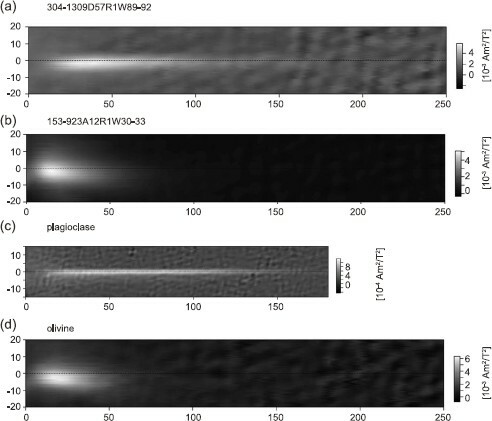 Two remanence components were observed in all samples with varying magnitude. The lower coercivity component shows a near vertical downward direction. This component was usually demagnetized by ~15 mT. This component is interpreted to be a drilling induced overprint. After the removal of this, a single component decaying toward the origin was observed in most samples. This is taken to be a characteristic remanence (ChRM). Except for a few samples with a very severe drilling induced overprint (Fig. 2(b)), most of the samples revealed a ChRM with a negative inclination. Together with the available age constraint of the samples, the negative inclination indicates that the samples were likely to have formed during the Matuyama interval. Orthogonal vector plots of AF demagnetization of NRM for representative samples. Open squares are projections on the vertical plane, and filled circles are projections on the horizontal plane. Azimuthal orientation follows the ODP/IODP convention. (a) Sample with clear characteristic remanence after demagnetization of vertical downward drilling induced overprint. (b) Sample with pronounced overprint which masks characteristic remanence. In total, 30 samples were measured. Five samples were accepted, 3 (out of 18) from the Leg 153 samples, and 2 (out of 12) from the Exp. 304/305 samples (Fig. 3(a) and 3(b), Table 1). Of the rejected samples, 11 samples failed to meet criteria 3 (Fig. 3(c)), 5 samples failed to meet criteria 1 (Fig. 3(d)), and 9 samples failed to meet criteria 2 (Fig. 3(e)). Some samples showed an anomalously low NRM/TRM slope relative to the paleointensity values expected from volcanic data, even though they showed little sign of laboratory alteration (Fig. 3(f)). 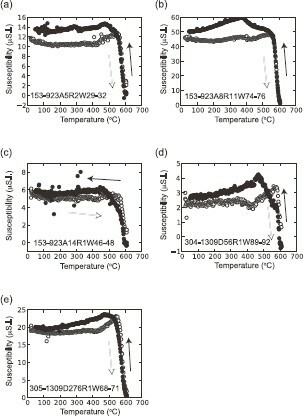 High-temperature susceptibility data support the stability of the samples upon heating and show the dominance of near stoichiometric magnetite (Fig. 4). Results of the Shaw paleointensity experiments. 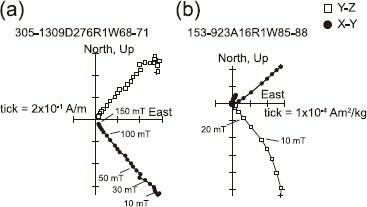 On the left are the NRM-TRM diagrams which constrain the paleointensity. The magnitude of the laboratory field used to impart a TRM was 30 μT. The inset of each plot shows orthogonal vector plots of AF demagnetization of NRM; squares show projections on the vertical plane, and circles show projections on the horizontal plane with an orientation following the ODP/IODP convention. On the right are the ARM1-ARM2 diagrams which check laboratory alteration. The color of each symbol shows the AF demagnetization step as indicated by the color bar. (a) Successful result from a Leg 153 sample. Demagnetization of this sample was performed by an in-line demagnetizer of cryogenic magnetometers. (b) Successful result from an Exp. 305 sample. (c) Result failed to meet slope = 1 condition in the ARM1-ARM2 plot. (d) Result failed to show characteristic remanence. (e) Result failed to show linearity in the NRM-TRM plot. (f) Result with anomalously low slope in the NRM-TRM plot. Demagnetization of this sample was performed by an in-line demagnetizer of cryogenic magnetometers. High temperature susceptibility measurements. Open circles are heating curves, and filled circles are cooling curves. MAD: Maximum angular dispersion; Dec: Declination; Inc.: Inclination. Entries in italic represent values that failed to meet the selection criteria. 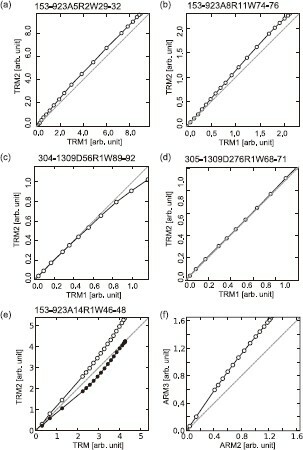 For most of the successful samples, the TRM2 are close to the first TRM (Fig. 5), supporting the contention that the first TRM was indeed a total TRM. The only exception is the sample 153-923A14R1W46-48 (Fig. 5(e)). This sample shows a TRM2 much stronger than the first TRM. This may indicate that the first TRM was not a total TRM; alternatively, this may be due to chemical alteration. To distinguish them, I imparted another ARM (ARM3) and compared it with ARM2 (Fig. 5(f)). The AF decay curves of ARM2 and ARM3 are different, indicating the sample was altered during the second heating. After correcting the TRM2 using the difference between ARM3 and ARM2 (Rolph and Shaw, 1985), the corrected TRM2 is close to the first TRM (Fig. 5(e)). This indicates that the first TRM of the sample 153-923A14R1W46-48 was also a total TRM. Although the corrected TRM2 still shows some difference from the first TRM, this behavior should not cast any doubt on the original paleointensity experiment considering the agreement between ARM1 and ARM2. Second TRM test. Filled symbols in (e) represent the comparison between TRM2 corrected by ARM with the first TRM. (f) The ARM3-ARM2 plot for the sample 153-923A14R1W46-48 showing laboratory alteration. Samples revealed a relatively strong anisotropy with an anisotropy parameter Pj (Jelinek, 1981) ranging from 1.27 to 1.49 (Table 2). The shape parameter Tj (Jelinek, 1981) ranged from oblate −0.15 to 0.73, indicating various shapes of anisotropy from oblate to prolate. Pj and Tj: Jelinek's (1981) anisotropy parameters. RMS: residual mean squares of the least square fitting of an anisotropy tensor. Kmin: minimum eigenvalue of the anisotropy tensor. The ratio RMS/Kmin measures the error in the tensor fitting. Tables 3 and 4 list the hysteresis parameters for loops for bulk rock samples as well as mineral separates, and Figs. 6(a)–(c) shows representative major hysteresis. As mineral separates, plagioclase and olivine were measured on the basis of the microscopic observations (Fig. 1). Generally, the saturation remanence of olivine was stronger than that of plagioclase by ~1 order of magnitude (Table 4). This suggests that the magnetic properties of bulk rock samples, especially laboratory induced remanence, could be dominated by magnetite associated with the hydrothermal alteration of olivine. Analysis of major magnetic hysteresis parameters of bulk rock samples and mineral separates. (a)–(c) Example of slope-corrected major hysteresis loop (open circles) and back field demagnetization of saturation remanence (filled circles) of (a) a bulk sample, (b) a plagioclase separate, and (c) an olivine separate. (d) Summary of magnetic hysteresis parameters on a Day plot. Black circles are Leg 153 samples with successful paleointensity results, gray circles are Leg 153 samples with a low NRM/TRM, open circles are Leg 153 samples that failed in the paleointensity experiments, black triangles are Exp. 304/305 samples with successful paleointensity results, gray triangles are Exp. 304/305 samples with a low NRM/TRM, open triangles are Exp. 304/305 samples that failed in the paleointensity experiments, crosses are plagioclase separates, and diamonds are olivine separates. Hysteresis parameters for bulk rock samples. Hysteresis parameters for mineral separates. On a Day plot (Day et al., 1977), the specimens were plotted over the “PSD” region (Fig. 6(b)). Apparently, there is no clear difference between samples that were successful in paleointensity experiments and those that failed. Olivine and plagioclase separates were also plotted in a similar “PSD” region (Fig. 6(b)). Those results indicate that a Day plot is not effective in predicting behavior in paleointensity experiments to exclude samples dominated by secondary magnetite. FORC diagrams showed a different picture (Fig. 7). In FORC diagrams, the horizontal axis (Hc) is related to microcoercivity, and the vertical axis (Hu) is related to the interaction field (Pike et al., 1999; Roberts et al., 2000; Carvallo et al., 2004). Successful samples (Fig. 7(a)) showed a narrow horizontal ridge along Hu = 0, indicating the presence of non-interacting SD particles (Newell, 2005; Egli et al., 2010). On the other hand, samples with a low NRM/TRM (Fig. 7(b)) showed a distribution with less spread along the horizontal axis and more spread along the vertical axis, indicating a greater magnetostatic interaction. The peak position was slightly shifted to the Hu < 0 region, which also indicates a negative mean interaction field (Roberts et al., 2000). The FORC diagrams of plagioclase separates (Fig. 7(c)) showed a clear horizontal ridge along Hu = 0 extending to Hc > 150 mT with almost no spread along the vertical axis. The FORC diagrams of olivine separates (Fig. 7(d)) were similar to those of bulk samples with a low NRM/TRM. FORC diagrams of bulk rock samples and mineral separates. All diagrams are calculated using a smoothing factor of 3. (a) Sample that was successful in the paleointensity experiments showing a narrow horizontal ridge along Hu = 0. (b) Sample that revealed a low NRM/TRM in the paleointensity experiments showing a concentrated peak. (c) Plagioclase crystal showing a narrow horizontal ridge along Hu = 0. (d) Olivine crystal showing a concentrated peak. The domain state of the plagioclase was estimated to be PSD on the Day plot and SD on the FORC diagrams. The difference may be due to the effect of anisotropy. Theoretically, SD grains oriented at specific angles to an applied field would exhibit the major hysteresis parameters ranging from “SD” to “MD” values on the Day plot (Stoner and Wohlfarth, 1948). Although the reversal mode of actual tiny grains may not be the coherent rotation (e.g., Williams and Dunlop, 1995), angular dependence of the Day plot parameters were indeed observed for exsolved magnetite (Gee and Meurer, 2002) as well as synthetic iron rods (Milne and Dunlop, 2006). On the other hand, the theory predicts that the coercivity of a single uniaxial SD particle varies only by a factor of 2 with the angle between the field and the easy axis. The horizontal axis of the FORC diagrams can be most simply interpreted as the coercivity of single SD particles (Roberts et al., 2000). Thus, the SD signal of the FORC diagrams may be less sensitive to the grain orientation than the Day plot parameters. This explains the results of the present study where the plagioclase are more scattered on the Day plot than the olivine, while the FORC diagrams suggest that the plagioclase are much more SD like. The strong anisotropy of the plagioclase with exsolved magnetite could result in the scatter on the Day plot. The FORC diagrams (Fig. 7) corroborated with microscopic observations (Fig. 1) provide strong suggestions about the microscopic origins of different behaviors in the Shaw paleointensity experiments. The similarity between the FORC diagrams for successful samples (Fig. 7(a)) and those for plagioclase separates (Fig. 7(c)) indicates that the successful Shaw paleointensity estimates assess the magnetite exsolved in plagioclase (Fig. 1(a)) which is composed of non-interacting SD particles. The near-ideal horizontal ridges are rare even in volcanic samples (Carvallo et al., 2006), so igneous magnetic minerals are unlikely to explain the horizontal ridges observed in successful samples. The similarity between the FORC diagram for low NRM/TRM samples (Fig. 7(b)) and those for olivine separates (Fig. 7(d)) indicates that the magnetite associated with the hydrothermal alteration of olivine (Fig. 1(b)) carries a low NRM/TRM ratio. Although the FORC diagrams indicate some magnetostatic interactions, the interaction seems to be low compared to volcanic rocks which yielded successful Thellier paleointensity results (Carvallo et al., 2006); thus, the magnetostatic interactions are unlikely to explain the low NRM/TRM. The low NRM/TRM is considered to simply reflect the low efficiency of chemical remanence (e.g., Stacey and Banerjee, 1974). These results indicate that FORC diagrams are effective in distinguishing fresh bulk samples with exsolved magnetite from samples dominated by magnetite produced by hydrothermal alteration. The cooling rate effect on paleointensity estimates was tested using the paleointensity results together with cooling rate estimates for some oceanic gabbros and volcanic paleointensity data. 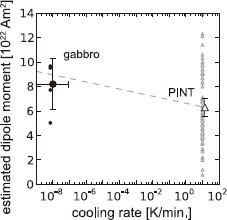 On the basis of the multiple NRM components, Gee and Meurer (2002) argued that the cooling rate of the Leg 153 gabbros around 500°C were on the order of 102°C/m.y. Other cooling rate estimates of gabbros at slow spreading ridges using elemental diffusion or simple thermal modeling gave 103~3–4°C/m.y. (Coogan et al., 2007). I take the 104°C/m.y. as the approximate upper bound and 102°C/m.y. as the lower bound of the cooling rate of my samples. The paleointensity method is either the Thellier method (Thellier and Thellier, 1959; Coe, 1967) with partial TRM checks (accounting for 60 records), or the Shaw method with or without correction (19 records). The number of specimens used to produce the tensity value is at least 3. The standard deviation of the paleointensity is not greater than 25%. The magnetic polarity is known and not transitional. The mean virtual dipole moment (VDM) of the 69 records was 6.3 ± 0.73 [1022Am2], where the uncertainty is given as a 95% confidence interval (Table 5). * see text for data selection criteria. Lat: Present day latitude. Hanc: estimated paleointensity. Hanc_anis: paleointensity after anisotropy correction. VADManis: VADM after anisotropy correction. The paleointensity estimates from oceanic gabbros are converted to a virtual axial dipole moment (VADM) using the present day latitude of the drilling Sites (24°N for the Leg 153 samples and 30°N for the Exp. 304/305 samples). The oceanic gabbro layer formed at slow-spreading ridges is considered to be tilted due to detachment faulting (Garces and Gee, 2007; Morris et al., 2009; MacLeod et al., 2011), and their present remanence inclinations may not reflect the geomagnetic inclination at the time of remanence acquisition. I obtained the mean VADM of 8.2 ± 2.1 [1022Am2] after the anisotropy correction (Selkin et al., 2000); before the correction, the mean was 8.3 ±2.3 [1022Am2] (Table 5). It should be noted that the temperature of magnetite exsolution is not well constrained for plagioclase. If this is lower than the Curie temperature of magnetite, the paleointensity estimate may not be accurate (Stacy and Banerjee, 1974; Fabian, 2009). In such a case, the exsolved magnetite is likely to acquire a classical grain growth thermochemical remanence, which is less efficient than TRM (Stacy and Banerjee, 1974); thus, the VADM estimated here may be viewed as a lower bound. Using cooling rate estimates for oceanic gabbros (Gee and Meurer, 2002; Coogan et al., 2007), the formula given by Halgedahl et al. (1980) for SD magnetite predicts that the cooling rate effect results in a 37–46% paleointensity overestimation in my samples. The present data are generally consistent with this prediction (Fig. 8). The mean paleointensity estimates from the gabbro samples (8.2 [1022Am2]) is higher than the mean VDM from volcanic data (6.3 [1022Am2]) by 30%. Analysis of the cooling rate effect on paleointensity estimates from gabbros and volcanic data in the PINT database. Open triangles are volcanic data (small symbols are cooling unit means, and the large symbol is the overall mean with a 95% confidence limit). Filled circles are gabbro data (small symbols are the results of individual samples, and a large symbol is the mean paleointensity with 95% confidence limit for estimated VADM. The horizontal error bar indicates the plausible range of the cooling rate; see the text for a discussion). The dashed line represents the theoretical paleointensity overestimate (Halgedahl et al., 1980) with respect to the mean VDM calculated from the PINT data. The present study has revealed that exsolved magnetite in oceanic gabbros provide the expected paleointensity, and that FORC analysis is effective to find samples dominated by exsolved magnetite. Exsolved magnetite seems to be common in oceanic gabbros (Davies, 1981), and it has been also reported from continental plutonic and metamorphic rocks (e.g., Selkin et al., 2000; Usui et al., 2006; Wenk et al., 2011). In particular, oceanic gabbros of various geologic ages are preserved on land as ophiolites, and some of them have been successfully investigated for paleointensity (Granot et al., 2007). The present results form the basis for further paleointensity investigation of such materials. Magnetite exsolved in plagioclase show distinct FORC diagrams with a pronounced central ridge. This is in sharp contrast to most igneous rocks (Carvallo et al., 2006) and to the altered olivine. Therefore, FORC diagrams can be a very effective pre-selection tool for paleointensity studies on plutonic rocks which contain exsolved magnetite. The mean paleointensity estimates from the gabbro samples (8.2 [1022Am2]) is higher than the mean VDM from volcanic data (6.3 [1022Am2]) by 30%, being consistent with the prediction of simple SD theory in my oceanic gabbro samples. A greater sample number is necessary for a quantitative assessment. Paleointensity investigations of oceanic gabbros complemented by FORC analysis will be an effective strategy to constrain the time evolution of the geodynamo. This study used samples provided by the Ocean Drilling Program (ODP) and Integrated Ocean Drilling Program (IODP). I thank Yuhji Yamamoto for access to the AGFM. I would also like to thank Kazue Tsuchida for help in the laboratory, Toshiya Kanamatsu for encouragement, and John Tarduno for critical discussions during the early stage of the study. I am grateful to an anonymous reviewer and Yuhji Yamamoto for constructive reviews.